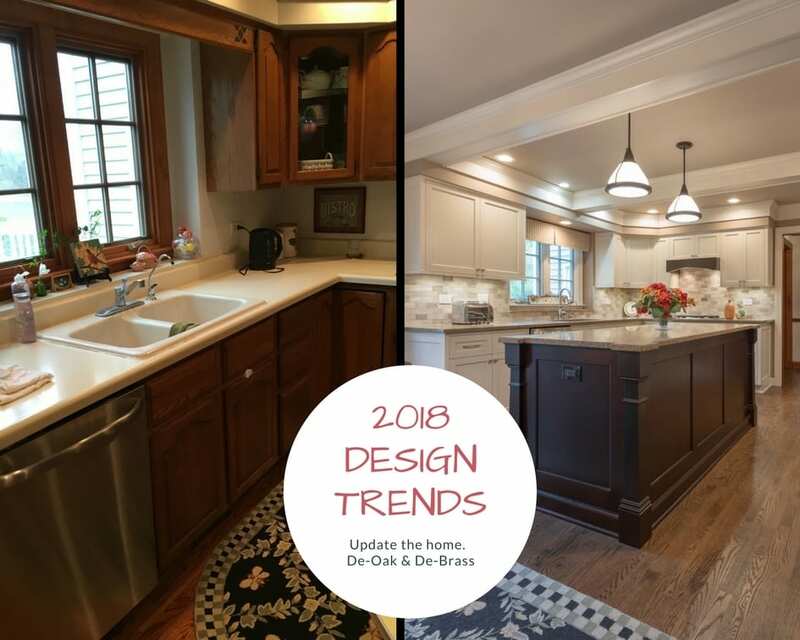 It’s 2018, the beginning of the new year, and time to take a look around the house and consider home improvements. Many are contemplating major home improvements and looking for a guide to updating their home. Most importantly, recommendations and solutions that will increase the value of the home for resale. 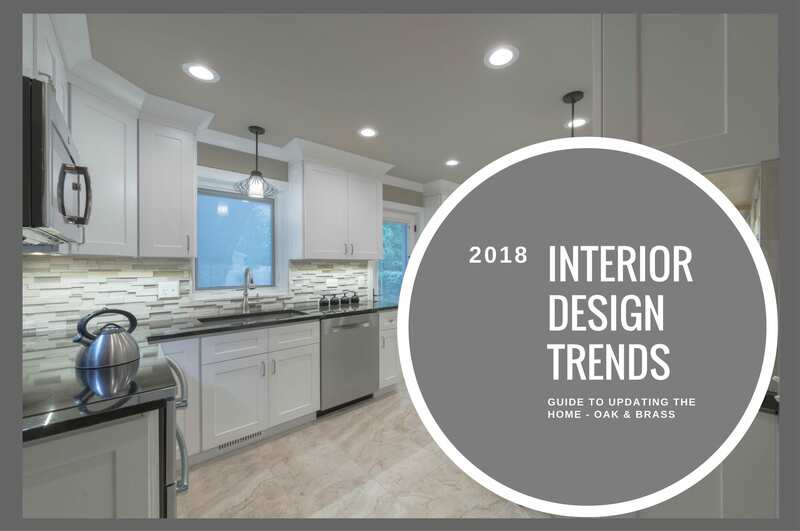 With that in mind, we’ll talk about 2018 Interior Design Trends and out-dated oak and brass in the home. We all remember the popularity of oak and brass in our past decors. At one time, it was a design trend and became a staple in many homes. Today, when making decisions on updating the home, many people have a dilemma. They are stuck with these out-dated design elements and don’t know what to do about them. My clients have asked, should they keep brass and oak features or replace them? There is a cost involved in replacing cabinetry, trim, doors, flooring, hardware and lighting. Some people feel its hard to justify the expense of home improvements. But, they want to increase the value of their home and make it more attractive to a potential buyer. As we all know, the values of our homes declined due to the housing market crisis. In many areas of the country, housing prices have recovered and increased. But in others, home values are still coming back from the decline. This is the main reason home owners have hesitated making upgrades to their residence. The good news, is that a full recovery is on the horizon. 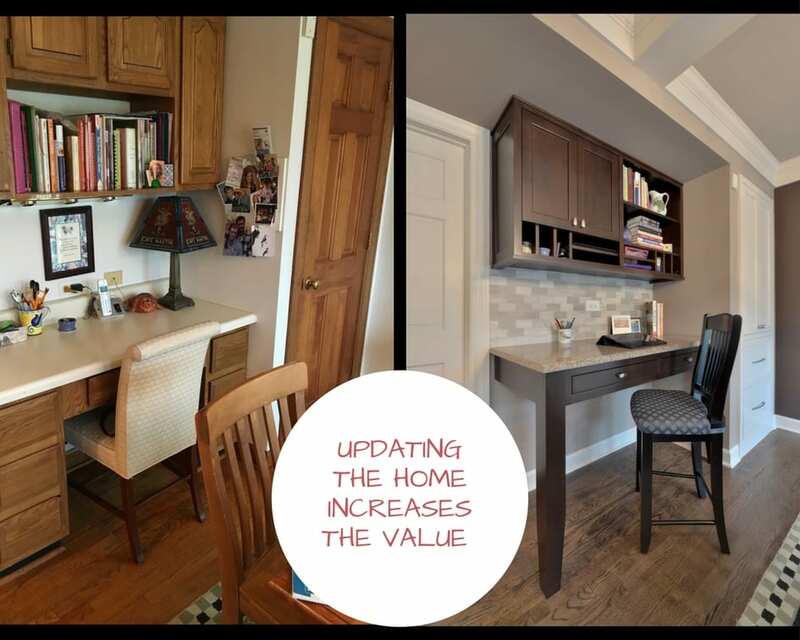 It’s a fact, updating the home increases the value. If you have any of the following items in your home, chances are, you have an outdated home. Today, in some cases, these items can be a visual nightmare in a home. My recommendation, de-brass and de-oak your home ASAP. First, it will create a more pleasant place for you to live. In addition, it will increase the value of your home by bringing it up-to-date. Here are my recommendations for removing or refinishing out-dated oak and brass elements in your home. Use solid, 1 or 2 panel doors, shaker or raised panel style. **Note: Painted doors are the most popular choice today. When replacing baseboards, 5 1/4” size trim works great for most applications. This size is a bit larger and gives a classy appearance in a room. I like Colonial and Cape Cod styles in traditional spaces. The Craftsman style is great for a simple “less is more” look. Look to the style of your home when making your selection. Replace your brass knobs with brushed nickel or bronze handles. I like levers vs. knobs for most doors. Don’t forget to replace the hinges as well. Match them to the door handle finish. There are a ton of cabinet hardware choices on the market. Chrome or brushed nickel are among the most popular. Use knobs on doors and handles on drawers or vise versa. 2 1/4” red oak flooring is out-dated, popular and costly to replace. Therefore, I recommend refinishing this floor, rather than replacing it. This is a cost effective solution. When refinishing your floors, think about darker, browner stain colors. A few good choices are made by Minwax. They are Provincial and Jacobean. Also, top coat with a latex based satin finish. If replacing your floor is an option, consider wide plank wood. White oak is a great choice because of the variety of stain colors that work with it . Hand scraped flooring is a popular pre-finished choice, but keep in mind it’s trendy. Classic Grey, by Minwax, is a popular and also trendy stain color. Shaker style (flat panel) cabinets are popular. I like painted and stained cabinets. I also like the island cabinets off set from the perimeter cabinets. For example, a nice look may include painted, off white perimeter cabinets with a darker stained island. If you have 8 or 9 foot ceilings, make sure your design allows the cabinets to go all the way to the ceiling. I’ve found that the most popular light fixture finishes are brushed nickel and bronze, depending on your decor. Use pendants over kitchen sinks and islands. Replace flush mounted fixtures or remove and install recessed led cans. For cost effective savings, use led bulbs. Bulbs with a 2800-3000k temperature of light create a pleasing, warm effect. Before purchasing, make sure to check the package and fixture requirements before you purchase. Wall colors have progressed, beiges have gone greige. Popular accent colors are browns, blues, dark greys and iron ore colors. Use these accents for focal walls. Consider a few rooms in muted greens or blues to add color. I hope this Guide to Updating you Home is helpful. And, I’m wishing your next Home Project is a success!